The Reflex Mark 2 paraglider designed by Mike-Campbell-Jones and manufactured by Eagle Flight Factory -England is one of the safest and tuck resistant gliders on the market. Its stability is now legendary. The name "Reflex" also refers to a wing section that has its elevator built into its shape. The wing becomes pitch positive and its stability is no longer dependent on the payload. The glider is a very sophisticated "aircraft" and has more controls than other paragliders. Except the Brakes , Trim and Speed Bar, the Reflex wing also has Wingtip Steering and Slow Bar. It is very solidly built and it was designed to last for about 700 hours! 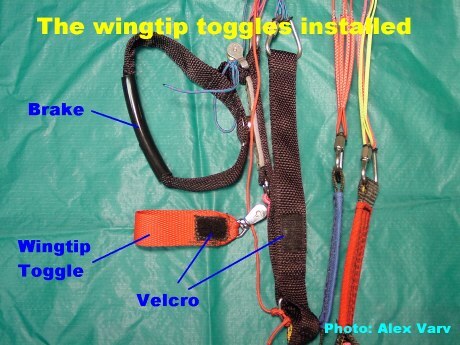 I purchased this wing for windier days or cross country flight where its speed and stability are very useful. 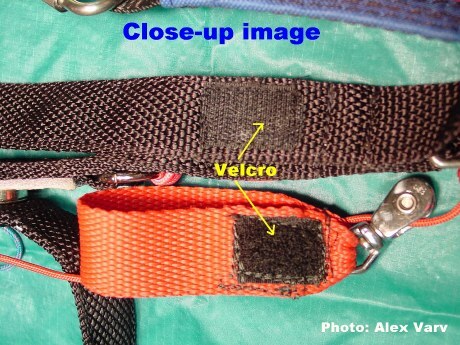 My findings about the Reflex wing were posted on pilotsppgclub@yahoogroups.com and I will not describe them in this material. The improvement I am about to present, was done mainly to make the wingtip steering more comfortable. Note: the Reflex has very high brake pressure because if the reflex airfoil and was designed to be flown with no brakes even in turbulence. 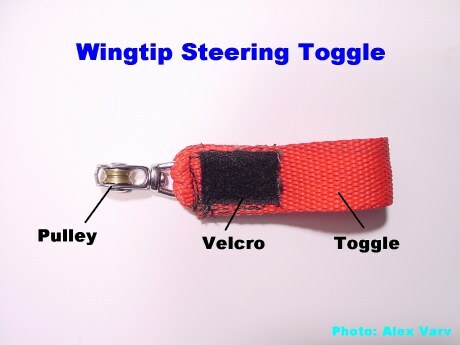 Mike Campbell-Jones found a very efficient way to turn: the wingtip steering. It consists of two additional lines connected to the wingtips which allow very easy and FLAT turns. I found the wingtip steering to be very effective but I wanted to further reduce the force needed to activate it. I built a mod that is similar to the brake toggles and it is attached to the lines via a pulley which will decrease the force (cut it in half) and provide a longer travel thus making the steering more precise. I have not tested this mod in flight yet. Therefore, this presentation is pure theoretical for the moment. As soon as I test it, I will add my findings to this article. 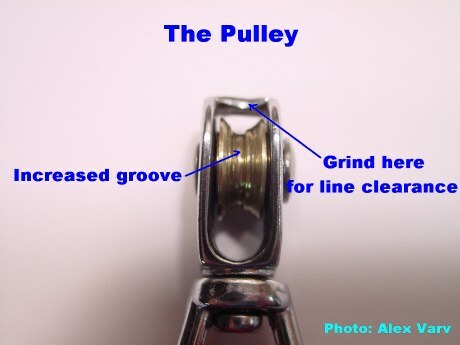 As seen in the picture, I increased the groove of the pulley using a Dremel machine with a cutter wheel. Please note the circles in the groove. 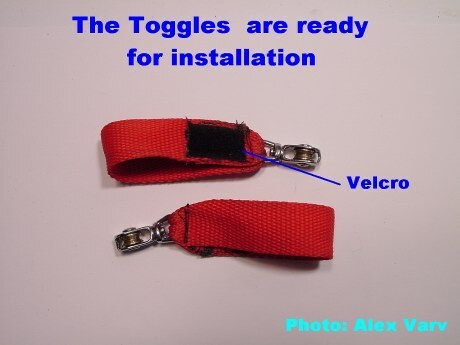 They provide additional friction so the pulley will turn and not rub against the line. The pulley was broken-in using WD-40 and spinning it with a circular wire brush on the Dremel at very high RPM. All the sewing was done with a regular sewing machine using a polyester thread. 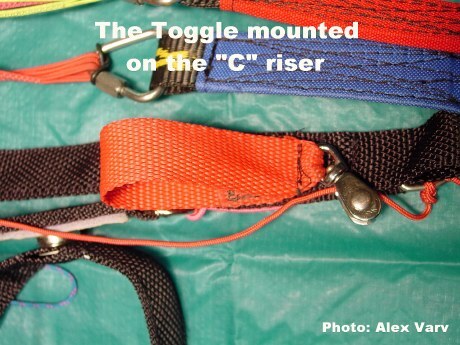 The velcro is attached to the "C" lines and when not in use, the wingtip steering toggles are fastened to the front side of the "C" riser for easy access.